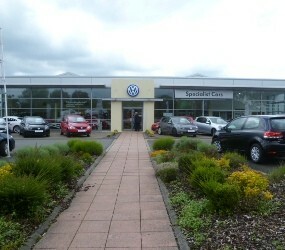 SHEPHERD Chartered Surveyors is offering a car showroom investment opportunity in Kirkcaldy, Fife. Prominently positioned on Caxton Place within Mitchelston Estate, the main commercial location within Kirkcaldy, a ten-minute drive from the town centre, the 16,460 sq ft modern showroom and workshop is let to Specialist Cars (Aberdeen) with a guarantee from John Clark (Holdings) on a Full Repairing and Insuring lease running until January 2026 on a passing rent of £117,500 per annum. The property comprises a detached showroom facility, which benefits from full height glazing, with associated service and body workshop, with office accommodation contained within the showroom. Externally, there is a service yard and car parking to the side and rear elevations whilst, to the front, there is a substantial surfaced area for external car sales display. Neighbouring occupiers include a number of similar car dealerships, including Arnold Clark, Peter Vardy and Brenwood Motor Company. Jonathan Reid, commercial surveyor at Shepherd’s Kirkcaldy office, said: “We are instructed to seek offers in excess of £1.75 million. A purchase at this level would reflect a net initial yield of 6.35 per cent after allowing for purchaser’s costs of 5.8 per cent.